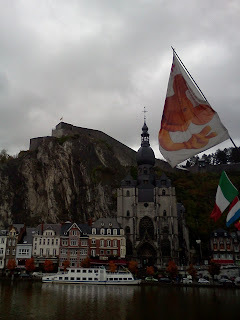 I left Brussels on Saturday morning for Dinant, a destination chosen randomly to be spontaneous. It's a little village on the Meuse river in southern Belgium which might as well be a world away. The raindrops clung to the window of the train carriage as we pulled out of the station and into the unknown. This was really the first major trip I've taken by myself, alone, since arriving; I considered it a private get-away of self-reflection. Indeed Dinant didn't fall short in either its majestic beauty or its adventure. A torrential downpour washed me down a flight of steps, broke my umbrella and left me miles from the hotel soaked from head to toe. Yet to the surprise of the smoking, and drinking patrons in the adjacent bar, I got up from my acrobatics, and finished my parade back to my lodgings. It should have jaded me, but I couldn't stop smiling- then laughing. I found it absolutely hilarious that none of this bothered me. 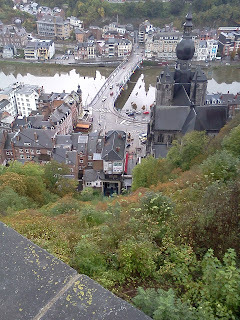 I know that makes me sound like a complete lunatic, yet here I was walking home, soaked, in the shadow of a 200 year old citadel, in the foot-hills of Belgium. I didn't care what happened. For those who think this is weird or strange, I can only tell you, that by the time you figure it out- it may be too late for you. Notre Dame and the citadel. Indeed the friends I came here knowing, I now barely know- but a whole new world of people and destinations have taken their places. I no longer ask when will my life begin. I know this is it. Indeed my "private" excursion turned ironically public the moment a dozen students from my school showed up. When does life begin? Conception, birth (No this isn't an abortion rant. ), or the moment you recognize your self-existence? Perhaps it's when you realize life is a dwindling commodity of time and happiness, where with each breath we risk our entire reality? I believe we begin living when we start risking those exhalations for something more than safety. For we are evolutionary survivors designed for self-preservation. We habitually nest, create an environment which makes life easy, routine, allows us to find comfort, and perhaps relax our instinctual self defense mechanisms. However it's usually when mankind finds such an equilibrium that they become too afraid to risk any of it for something better, something amazing. Is this living or is it just surviving? To be confined by the fear of our own making, and by this, we become not what we're capable of, but merely a product of complacency. Life begins when when you recognize that you've fallen down this hole (or stairs) of self-denial, and despite it all, knowing the odds, you choose to climb out of the wet muddy chasm that seems insurmountably difficult to ever escape, and do so with a smile and a laugh. If you're still waiting for life to begin, you better get climbing.